Place frozen banana chunks in a food processor or blender. Press the pulse button until the large pieces have broken into smaller chunks, then press ON and let the food processor go for 1 minute. Scape down the sides, then add the Greek yogurt and blend another 1-2 minute or until mixture is completely smooth and appears somewhat whipped. Add chocolate chunks, if desired. 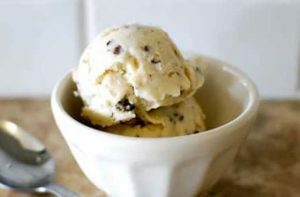 Serve immediately, or remove mixture to a bowl and freeze 1-2 hours or until consistency is more like ice cream. Enjoy!